I just got this bike yesterday and I've done only one ride on it, I'll update this as I get more experience with it. 25+ years of riding and racing on various terrains. Clement X'Plor MSO 36mm, set up tubeless. First attempt at ~50 psi. - Frame is no frills but actually fairly nice. There doesn't appear to be any fancy hydroforming on this, it's pretty much just round tubes. Rear fender and rack mounts, "Breezer" shrouded rear dropouts, 2 bottle mounts. The frame's got a large Kinesis sticker on it so no mystery who made it. Welds are well executed. Somewhat "compact" look with a very slight slope to the top tube. I also looked at the alloy Diamondback Haanjo and this appears to be EXACTLY the same frame as that bike. - Carbon fork is very, very beefy. Much thicker cross section than a typical non-disc fork. - This 55 has a ~790mm standover with the upgraded 36mm tires. Geometry is fairly standard "endurance road" 72/73 with 430 chainstays. 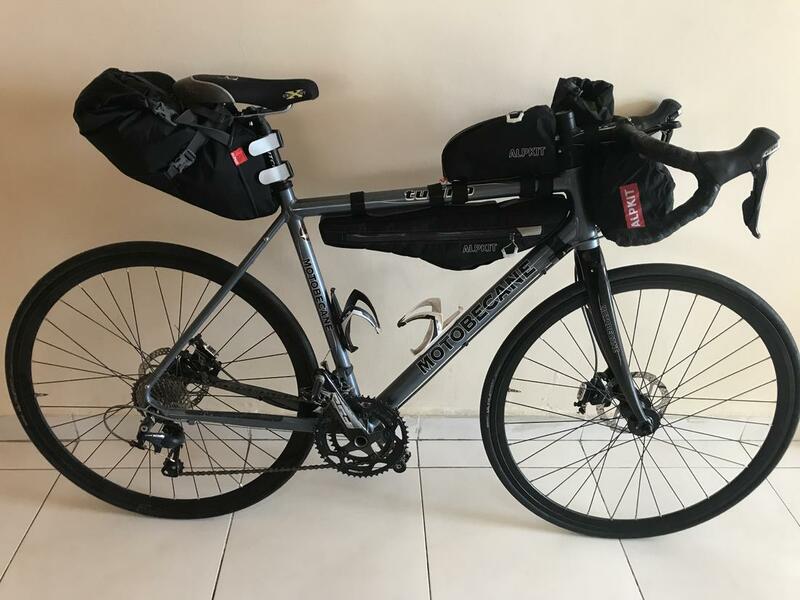 Not racy, not touring. - I set the bike up fairly upright with a ~1" saddle to bar drop. The headtube is not as long as some other gravel models out there, this is more of a road frame. - Tons of tire room in this frame and fork. 36mm tires fit easily, i'll bet you could get some fairly knobby 45s in there. - I think the matte black paint is extremely nice looking. I waited several months to get this color and it was well worth it. Gloss black logos are much more subtle than Moto's typically loud awfulness. Aesthetically this is a good looking bike: everything is black, black and more black (none more black). - 6800/685/785 componentry is unsurprisingly excellent. This one has a medium cage RD. I'd love to see Shimano come out with a clutched version of this derailleur for rough gravel riding. 785/685 brakes are extremely powerful and need to bed in, I'll give them a couple of weeks. - FSA Gossomer crank is fine but nothing special. 50/34. - 12-32 Ultegra cassette, you could climb some seriously steep stuff with this bike. - Joytech hubs are cheap-o at first glance. Minimal machining, cup and cone, no frills. This is one spot where BD saved a few bucks. We'll see how they do. - Biomax bars are really weird. Other may like them, I'm probably going to ditch them. The 4 Axis Comp stem is nice. - Carbon Ritchey post and Ritchey Streem saddle are both pretty nice. - Old reliable external cabling and external threaded BB on this one. Old school but huge selling points for me. I replaced all of the crappy clips on the hydro tubing with thin cable ties: much more secure. Overall, for the $1,300 I paid I'm very pleased. I noticed that they raised the price on the bike $100 now so it's $1,400. Still, a major label bike with the same build and similar frame will run you right at least $2K. I'm going to ride the snot out of this bike over the coming weeks and into the winter. Pics and more reports coming soon. Last edited by Hiro11; 08-29-2016 at 11:17 AM. Not a fan of the "brand new bike" look. I did a ten mile shake down to settle the sealant and check everything out. I need to get some miles and dirt on it. Everything works great. The 685 hoods are noticeably bigger than standard road hoods, likely due to the hydraulic cylinders. Tires are the relatively new tubeless MSO, both have a bit of wobble but no hop. Those are Deore XT trekking pedals. Stainless cages. Very upright set up as I said, bars are about an inch below the saddle. That's a 29" saddle height to the center of the crank as shown. There is TONS of room with these 36 tires. You could go much bigger if you wanted. Last edited by Hiro11; 08-29-2016 at 06:28 PM. Last edited by Hiro11; 10-10-2016 at 02:26 PM. This bike with these tires is awesome on gravel. 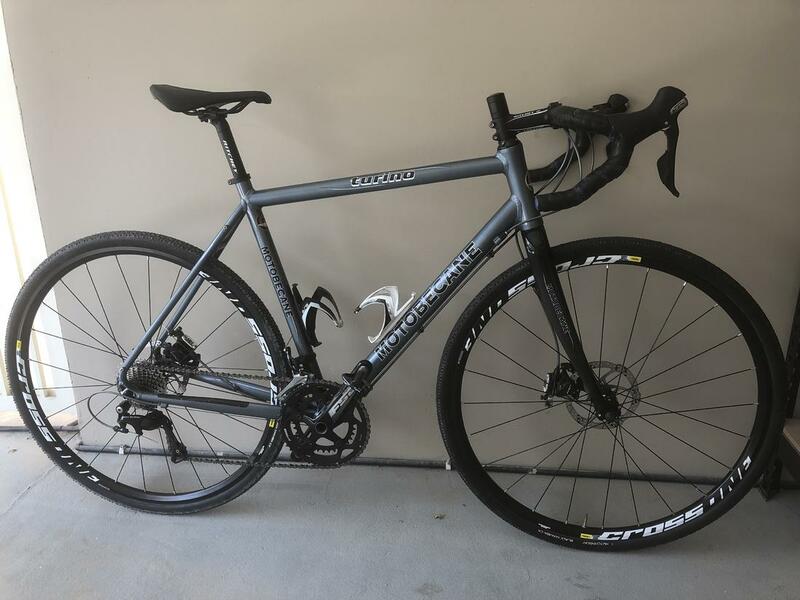 I rode 50+ miles on some really rough golf ball sized gravel at paceline speeds and the bike was very stable and grippy. MSOs were at 60 PSI, I should have gone a bit lower. 1. The chainstays are very thick and I occasionally bump them with my heels. No big deal but worth noting. YMMV. 2. The front end is compliant without being overly floppy. A straight 1 1/8 steerer seems ideal for gravel and endurance. This front end compliance combined with the long chainstays means that this frame is pretty far from racy, though. This bike would not be my first choice for a local crit. 3. The frame is not very stiff. I can rub the FB fairly easily out of the saddle and I weigh about 160. I actually prefer less-stiff frames so this suits me just fine, especially on gravel. YMMV. 4. I've grown to really like these wacky bars, they are truly bizarre but they work for me. One note: the design makes reaching the levers a bit of a stretch with my average-sized hands (I'm exactly 5'10"). 5. I ditched the Streem saddle and installed a Specialized Romin Evo. Much better for me. YMMV. The Streem is nicely made, just the wrong shape for me. The bike is still working great with about 1,200 miles on the clock. @Hiro11 - thanks for the write up! I am 5'9" inches and really on the fence between whether I should get the 53cm frame or 55cm frame. How big does the 55cm frame feel to you? Would it feel like a big mistake to go one size lower or do you think I can safely get away with it? Thanks!